In my previous post, I began talking about one of my most enjoyable armies to play, a Nurgle-themed Chaos Daemons army. I took a detailed look at the two Forge World units that I recently added to my army, the Nurgle Blight Drone and the Plague Hulk of Nurgle. This time I wanted to take a look at the standard Nurgle Daemon units from Codex Chaos Daemons. Plaguebearers are the core troop choice for a Nurgle Daemon army. They are renown for their resiliency and they are the undisputed kings of objective squatting. With a Toughness of 5, 5+ Invulnerable Save, and Feel No Pain (FNP), they can be difficult to kill. They are also Fearless, so if you want to get rid of them, you will need to kill off the entire unit. Plaguebearers have two distinct weaknesses. 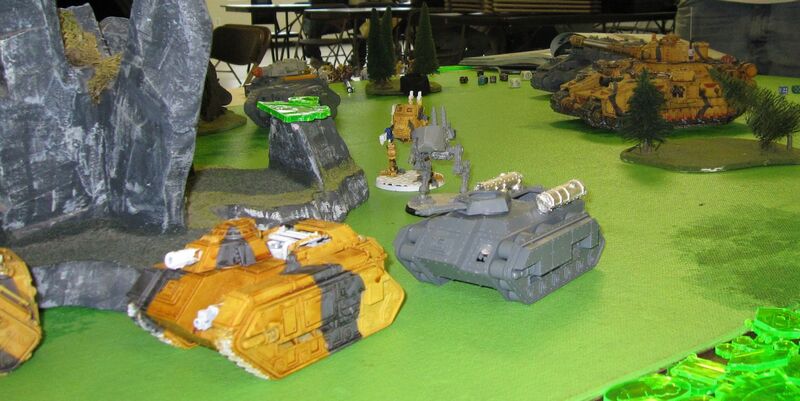 First and foremost, they are Slow & Purposeful and must take Difficult Terrain tests every time they move or assault. If you are not careful, they can be easily outmaneuvered or outran. Most enemy units will tactically retreat while firing at them and trying to stay out of assault range at the same time. Second, Plaguebearers have no ranged attacks. You can use this second weakness to help counteract the Slow & Purposeful by simply running them every turn you do not plan to assault. In close combat, Plaguebearers are best at tying up enemy units but can be decent otherwise. They are I2 and will practically always strike last, which is usually not a problem as the enemy will find them hard to kill given their resiliency. Although they only have one attack, their poisoned Plagueswords allows them to always wound on a 4+, and thanks to their high Strength, they will frequently be re-rolling failed to wound rolls. Personally, I prefer to run Plaguebearers in units of 15 models and with an Icon and no other upgrades. Stat-wise, Beasts are almost identical to Plaguebearers but with two significant differences. First, they have two wounds. With only a max unit size of seven models, this is important, especially since they do not suffer from Instant Death thanks to Eternal Warrior. Like Plaguebearers, Beasts too are T5, 5+ IS, FNP, and Fearless and are just as difficult to kill off. Second, they have D6 Poisoned attacks. I know a lot of players look down on them for this, and while there will be occasions when you roll a 1 for their attacks, the times you roll 6 will make them worth taking. A unit of seven Beasts, on the assault, has the potential for between 14-49 attacks! Combined with poisoned attacks and a high strength allowing for re-rolling failed to wound rolls, they have the potential to mow through just about anything. Like Plaguebearers, Beasts are also Slow and Purposeful. I always take a max unit of seven Beasts and I like to use them as Shock Troops. In my experience, they work best against small, highly armored units, like Terminators, where their potential for lots of attacks can pay off. At the least, the Beasts can tie the unit up for a couple of turns. IMO, the granddaddy of Greater Daemons. With a T6, 5 wounds, 4+ IS, and FNP, it will take a lot of firepower to bring this monster down. A GUO is pretty decent in close combat. With a high WS, Noxious Touch and a high strength, he will generally hit on a 3+ and will always wound on a 2+, almost always with re-rolls for failed To Wound rolls. As a Monstrous Creature, it ignores Armor Saves and rolls 2D6 for Armor Penetration. Keep an eye out for your opponent throwing a large block of expendable troops at it in an attempt to tie it up for as long as possible. If you know this could be coming, or you are going up against a Horde army, you may want to consider taking the Aura of Decay gift. Like other Nurgle Daemons, the GUO also has the Slow & Purposeful universal rule, but as a Monstrous Creature, he rolls three dice to see how far he moves. As for gifts it is allowed to take, Cloud of Flies (acts as both offensive and defensive grenades) is a must. I like to take Breath of Chaos as it extends the GUO's reach, but I will forgo it if I am short on points. Unholy Might (+1S) is not really needed because of Noxious Touch. Instrument of Chaos is a good way to spend 5 extra points you may have left over that you cannot put anywhere else. I prefer to use the GUO as a shock troop and send it towards the biggest concentration of enemy units, or the biggest threat, in an attempt to draw as much firepower to it as possible. With some good dice rolling, it can withstand a lot of punishment before going down. Your opponent will be hard pressed to ignore it, and if they do ignore it, then the GUO will run amok their lines. I also find GUOs as the best way of dealing with enemy Dreadnoughts. This is not a unit I find the need to use. Swarms, in general, are not that good in 5th edition. The over abundance of blast weapons that I find in the game would just kill them off way to quick. Also, they do not have FNP like other Nurgle daemons. I prefer to spend the points on more Plaguebearers. Next time I will look at the non-Nurgle aligned units that I commonly use. Since acquiring a Nurgle Blight Drone, I have been playing my Nurgle Chaos Daemon army more. This is one of my most enjoyable armies to play even though I rarely win with it. When I first started playing it, I was lucky if I could get a draw. Now, with the addition of the Blight Drone and a (proxy) Plague Hulk of Nurgle, I think it is on its way to becoming a fairly competitive army. Here is my 2000 point list. Before the addition of the previously mentioned models, I would run this same basic army but I would use four units of 15 Plaguebearers. This army was slow and had very little ranged firepower. 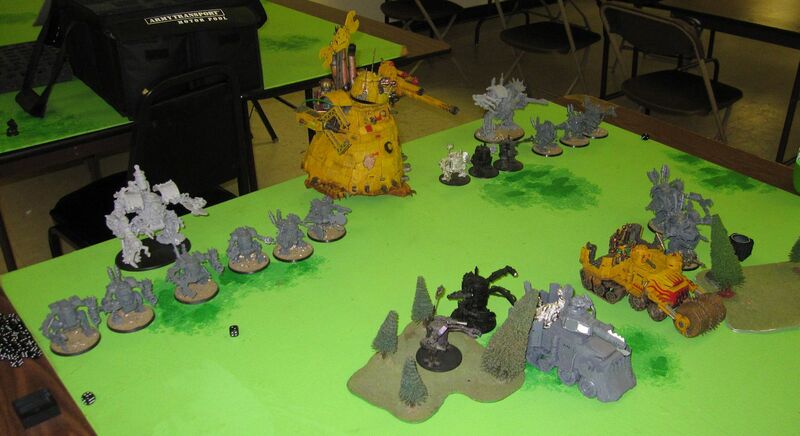 The Soulgrinder and the Daemon Prince (with Daemonic Gaze) were the only two models with ranged attacks. They were also the only models that were not Slow & Purposeful. Get rid of them and my army would crawl. Let's take a closer look at these two new units. 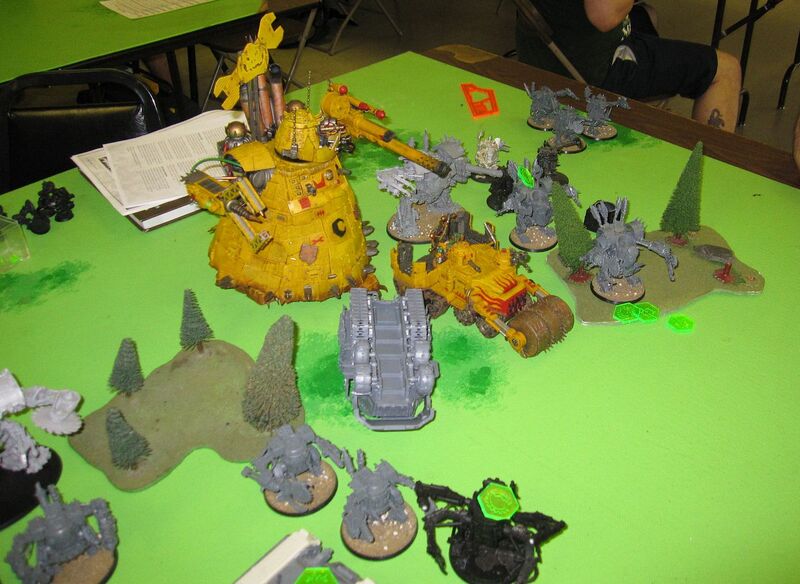 The Nurgle Blight Drone is a Fast Skimmer with some decent firepower, but it is lightly armor (12/11/10). It costs a pretty penny (125 points) but is worth it. It's a Daemonic Engine and it does not suffer from Shaken or Stunned damage results (something I overlooked when I first used one). It is armed with a Mawcannon with Vomit (Template; S6; AP4; Assault 1) and Phlegm (36"; S8; AP3; Assault 1, Large Blast), and a Reaper Autocannon. It also treats all Destroyed-Wrecked damage results as Destroyed-Explodes, which can make enemies think twice before assaulting it. The trick to using one is having it survive the first round after it Deep Strikes in as it is a sitting duck for that turn. Also, as a follower of Nurgle, anything it kills counts towards Epidemius' Tallyman count. 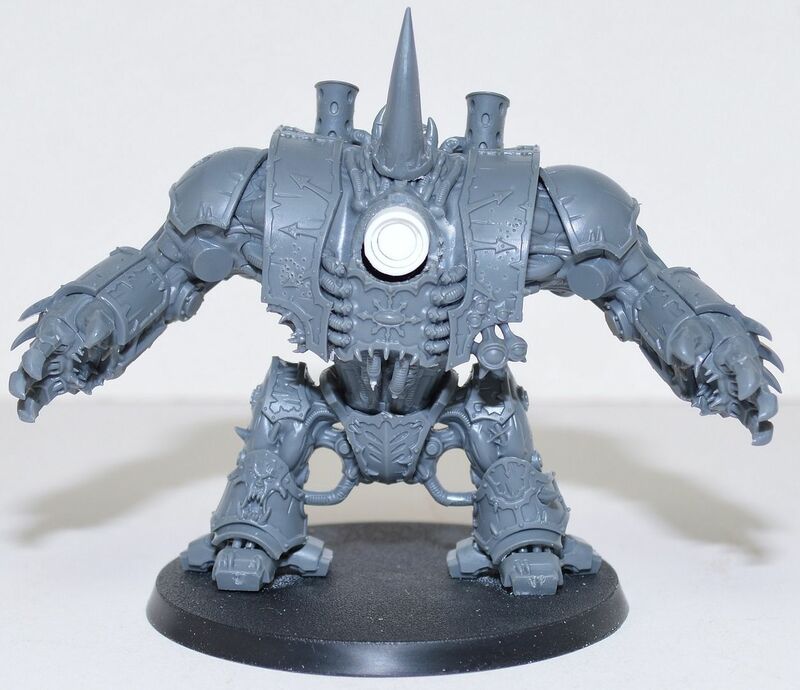 The Plague Hulk of Nurgle is a modified Soulgrinder. It loses Fleet but gains Necrotic Fumes (grants 5+ cover save and counts as having both Offensive and Defensive Grenades) and is equipped with Smoke Launchers and, oddly enough, a Searchlight. It also loses the Mawcannon and Harvester cannon, but gains the Rot Cannon (36"; S6; AP3; Ordnance 1, 5" Blast, Rending) and Rancid Vomit (Template; S5; AP3; Poisoned (3+)). Plague Hulks are also followers of Nurgle and get to add their kills to the Tallyman count. I will no longer have to proxy a Plague Hulk as the one I ordered was delivered just last night along with a second Blight Drone. Expensive as these models are, they are at least dual-purpose. They can be used in a Chaos Daemon army or a Chaos Space Marine army that contains at least one unit of Plague Marines. It is inspiring me to get a Death Guard army running, but it will have to wait until I can finish some other projects first. Next up, a closer look at the other Nurgle Daemon units. Tuesday night I got to play my first game of 8th Edition Fantasy with my brand new Ogre Kingdoms army. 4th edition was the version that I played quite a bit back in the day, and I played a fair amount of 5th edition. I hardly played any 6th or 7th edition. With such a long break and all the rumors about 8th edition, I was really looking forward to playing a game. Technically my army was illegal because I was over 25% points with my characters, but I really wanted to try out a butcher. Butchers cannot be the army general, so I had to take a bruiser as well. My opponent let it slide. The game went pretty quick. On turn one, my Ogres went first and slowly advanced out onto the field. I rolled for my magic dice and got three and my opponent got 2 dispel dice. The Butcher cast Trollguts onto the Ironguts with Irresistible Force and his Miscast roll made him Frenzied. Then he successfully cast Bloodgruel on himself to attempt to regain wound, but it was dispelled. We were not sure if the Frenzied would prevent the Butcher from casting, but we just let him since it was just a practice game. The High Elves also slowly advanced onto the battle field. The Mage cast a spell (do not remember which one) with Irresistible Force as well, but ended up killing himself and four Phoenix Guard. On turn two, the Ogres were too far to risk charging, so they moved up closer. The Butcher tried casting Bloodgruel on himself, and for the third turn in a row, the first spell cast that turn was cast with Irresistible Force. The butcher rolled on the miscast table and he took 5 wounds and died. On the High Elves turn two, the Phoenix Guard charged the Gnoblars and the Dragon Princes (foolishly) charged the Leadbelchers. Both units stood and shot with the Gnoblars failing to kill any Phoenix Guard with their Sharp Stuff, but the Leadbelchers unloaded 16 shots with their cannons at the Dragon Princes killing three. After the charge, the Dragon Princes did four wounds to the Leadbelchers killing one and wounding the other, and the last Leadbelcher cause two wounds which were both saved. The last Leadbelcher, despite being right next to the general, failed its leadership check and fled combat, getting run down by the last of the Dragon Princes. The Gnoblars did not fair very well again the Phoenix Guard. The elves killed seven Gnoblars and the Gnoblars only managed to kill one Phoenix Guard. The Gnoblars lost combat, fled and were run down. Turn three saw the Ogre Bulls and Ironguts charging the unit of High Elf Spearmen with the BSB. I foolishly forgot to do my Impact hits for the charge (won't be forgetting that again). The High Elves struck first (as they always do) and managed to kill one Bull and one Irongut. The Bulls and Ironguts killed 9 elves and one combat, but they did not break. Turn three for the elves involved the Phoenix Guard and Dragon Princes preparing to charge the rear of the two remaining Ogre units. Meanwhile the battle between the HE Spearmen and the Orges (each unit lost one ogre) raged on with the Ogres winning combat again by two, but the elves held steadfast. Turn four had no movement or magic for the Ogres, so it was right combat. The Ogres again lost a single ogre each and the remaining ogres killed all the spearmen and left the Ironguts alone in combat with the BSB. 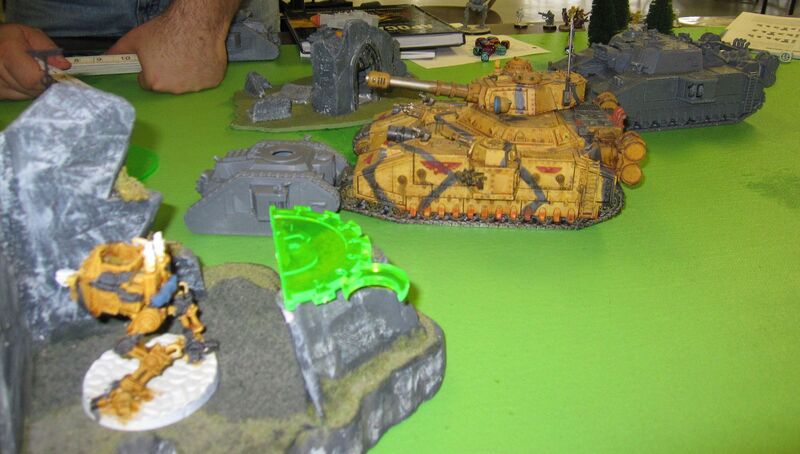 The Bulls reformed because they won combat and turned to face the charge of the Phoenix Guard. Turn four for the elves saw the Dragon Princes attempting to charge the Iron guts from the rear and failed (he rolled double ones). The Phoenix Guard successfully charged the Bulls. 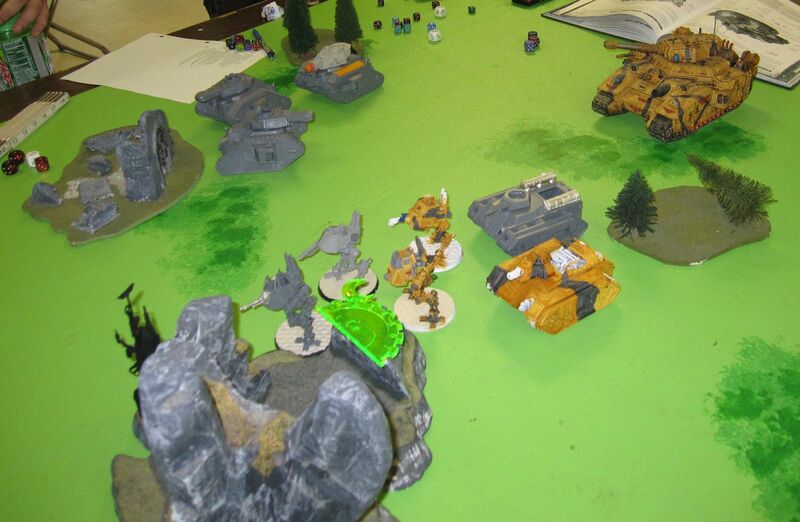 They killed one ogre, and the Bulls lost combat and fled, but the PG did not pursue. The HE BSB issued a challenge to the Bruiser who accepted and the BSB failed to cause any wounds to the big guy thanks to the Wyrdstone and then was immediately killed by the Bruiser. The Ironguts reformed to attempt to assult the Dragon Princes next turn. Turn five, the Ironguts charge the Dragon Princes and wiped them out without losing a single Irongut. 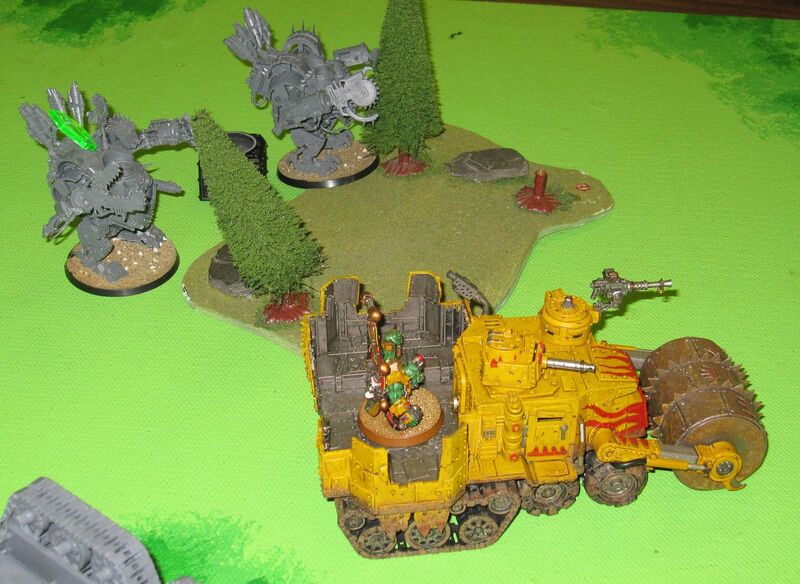 Then they reformed for the ienvitable charge of the Phoenix Guard. 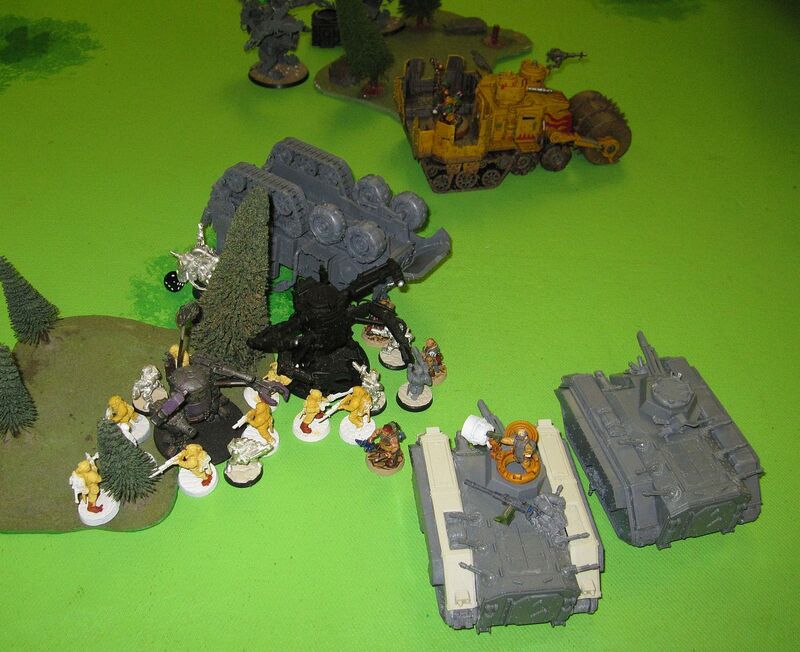 Unfortunately, when the PG charged, the Ogres lost their Bellower which caused them to lose combat and flee. Overall, I liked 8th edition. I really like the changes to charging and magic. Although I did not mention the Stomp attack that the ogres get in the battle report, it really helped the larger model units survive against the large small model units. I am looking forward to playing more.